The New My MedicAlert App lets you use the power of your health story to personalize your care, create your own support network and keep your My MedicAlert profile updated from your mobile phone. Manage and track your health on the go so that you can make better-informed decisions about your overall health and wellbeing. My MedicAlert® Mobile App gives you the ability to update & access your existing My MedicAlert® profile & medical record directly on the app through your mobile device anytime, anywhere. Build your Circle of Support and share your self-care journey with your loved ones. According to industry research, 75% of healthcare costs result from chronic diseases, which can be managed more effectively through the right behaviours. With the new My MedicAlert App, you have an accurate, shareable record of your experience between physician visits, and helps you and your team discover the treatment strategies that are working best for you. Note: If you do not have a MedicAlert online account, please contact a MedicAlert representative at 1-855-348-3251 to set that up. What is My MedicAlert App? My MedicAlert App lets you manage and track your health on the go and easily so that you can make better-informed decisions about your overall health and well-being. Your My MedicAlert App gives you the ability to access and update your My MedicAlert profile and medical record directly on the App through your mobile device anytime, anywhere. It also gives you access to a range of Health Tools to better manage your health. Do I have to pay to use My MedicAlert App? No. My MedicAlert App is free to use for all subscribers of MedicAlert. Subscribers just need to have an active My MedicAlert account. What Software and Products do I need to download and access My MedicAlert App? For iOS devices, you need require iOS 7.1 or later. Compatible with iPhone, iPad, and iPod touch. This app is optimized for iPhone 5, iPhone 6, and iPhone 6 Plus. For Android devices, you need an operating system running Android 4.0.3 and up. How and where do I download My MedicAlert App? My MedicAlert App is available in the Canadian Apple App Store for iOS devices, and the Google Play store for Android devices. Go to the Apple App Store on your iPhone or iPad, and search for My MedicAlert. Once installed, click on My MedicAlert App. Now you can start using your iPhone or iPad version of My MedicAlert App. Go to the Google Play™ app store on your Android device, and search for My MedicAlert. Now you can start using your Android version of My MedicAlert App. How do I access and login to My MedicAlert App? 2. Your MedicAlert service plan must be current. 3. 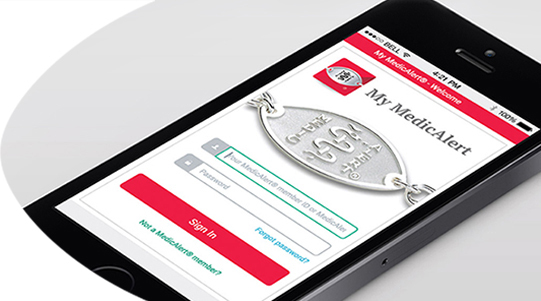 You will need your My MedicAlert account information to log into the App as it requires the same login and password. If you do not have a My MedicAlert account or forgotten your login or password, please visit www.medicalert.ca or contact a MedicAlert representative to set one up at 1 800 668 1507. What features should I expect to see when the download is successful? What are the benefits of the Health Tools on My MedicAlert App? Please note the customize health tools are separate from your MedicAlert profile and are for your use and are not shared with First Responders or available to the 24/7 emergency hotline. The health tools are only available on My MedicAlert App. What is the Difference between My MedicAlert online and My MedicAlert App? Only accessible on your mobile device and available once you download the App and have created a My MedicAlert account online. How quickly is information updated? All information updated in MedicAlert profile of the My MedicAlert App is instantaneously updated to your personal MedicAlert profile. In addition, all information updated in your personal Medicalert Profile (on the phone or online) will be updated in your My Medicalert App, the next time you login into your mobile account. Self Care Catalysts is the company that created and developed Health Storylines. Self Care Catalysts is a patient solutions, intelligence and analytics company that enables healthcare innovation. They are committed to advocating for patients and consumers when it comes to healthcare decisions. Their belief is that when patients are informed, respected, and engaged, they make better choices. Better choices mean better health outcomes. The Self Care Catalysts team is based in Toronto and San Francisco, and is made up of a group of health researchers, scientists, doctors, healthcare experience designers and software developers with a desire to improve patient self-care. Their mission is to build innovative, patient-centered, and technology-driven self-care solutions that complement medical modalities that will enable patients to continue managing their care outside of the clinical setting, with or without the support of healthcare professionals. If you don’t want to share your information for information purposes you can opt out by sending an email to Self Care Catalysts. You acknowledge and agree that, in the course of your use of the Platform, SCC will collect, process, and store information about you and your use of the Platform, including information about your health status and other personal data. This information will consist of your Content, which includes information about you obtained by SCC directly from MAFCA, and may include your Personal Information. “Personal Information” consists of any information that can be used to identify you and may include your name, email address, postal code or other physical address, gender, marital status, occupation, and, as applicable, other information required to make the Platform available to you or to process an online inquiry, interaction or transaction that you have requested or initiated. Your survey responses at any time and from time to time. When you register to use the Platform, your Personal Information residing in MAFCA’s database, such as your name, contact information, and medical information, will automatically, and without further action by either yourself or MAFCA, be populated into the Platform. When you update your Personal Information, either through MAFCA’s database or through the Platform, such update will automatically be incorporated into the other site. If you do not want to amend your Personal Information in the MAFCA database, such as your contact information or medical information, please do not amend that information in the Platform. SCC may share your Personal Information in response to valid judicial or other government subpoenas, warrants or court orders or other legal process in accordance with applicable laws or if SCC believes in good faith that such disclosure is necessary to prevent or take action regarding illegal or suspected illegal activity or to protect the rights or safety of SCC or any of SCC’s users, Partners or other third parties. SCC will use all reasonable efforts to provide you with written notice of any disclosure of your Personal Information under this paragraph. SCC has no control over, and is not responsible for, the privacy of your Content that you have shared with others so always use caution when giving out any personally identifiable or sensitive information. You further acknowledge and agree that SCC (but not MAFCA) will: (i) use your Content, solely on an anonymous and de-identified basis and aggregated with other users' information, for the compilation and analysis of trends, statistics and other information without any link or identifiable reference to you or your Content; and (ii) share its analyses with its business partners and third party advertisers and customers (collectively, “SCC Content Usage”). For the avoidance of any doubt, your Content will never be distributed to or shared with anyone other than MAFCA in a format that could identify you. You understand that SCC may also report individual adverse event and drug safety information on a blind basis to the FDA, the U.S. Centers for Disease Control and Prevention and/or other regulatory bodies (Canadian, U.S. and international) as well as directly to our Partners. As stated above, SCC will not provide your Personal Information to any such regulatory agencies, Partners or other third parties; however, from time to time, a Partner or other third party may want to contact you directly (i.e., to fulfill adverse event reporting requirements or for research purposes). In any such event, SCC will obtain your express prior consent via the Platform for such Partner or other third party to contact you via email at the request of any such third party. SCC takes commercially reasonable steps to protect your Personal Information from unauthorized access, use, disclosure or loss. The Platform has reasonable security measures (including online and off-line physical, electronic and managerial safeguards) in place to protect against the loss, misuse and alteration of the Personal Information under SCC’s control. In certain areas, Personal Information is maintained on a secured database accessible only by SCC personnel. SCC uses industry-standard encryption technologies to protect Personal Information submitted by you on the Platform. However, as with any transmission over the Internet, there is always some element of risk in submitting Personal Information online and SCC will not be liable for any breach of data security caused by circumstances outside its control, including unauthorized network intrusions. Children under the age of 13 cannot register as Users or otherwise use the platform. SCC does not knowingly collect Personal Information from the children under the age of majority in the province or the territory of their residence. If SCC learns that it has collected Personal Information of a child under the age of majority in the province of territory of residence, SCC will delete that personal information from the Platform. SCC encourages parents and guardians to go online with their children. Some Web browsers offer a "Do Not Track" ("DNT") signal, which is an HTTP header field indicating the User’s preference regarding tracking or cross-site user tracking. Because there is not yet a common understanding of how to interpret DNT signals, SCC does not currently respond to DNT signals, if any, that SCC may receive from any browsers. SCC takes privacy and meaningful choice seriously and will make efforts to continue to monitor developments around DNT browser technology. You will always have access to your Content, including all your personal Information on the Platform and may amend it at any time to ensure its acuracy and completeness. You may submit a request to correct, access or update your personal information be contacting us at the address below. If you have any questions about the security on the platform or SCC's Website, please contact SCC's Privacy Officer as set fourth below. Attn : Privacy Officer, Self Care Catalysts Inc.
To become a User to access and use the Platform, you must be a registered subscriber of MAFCA and must be one of the following: (a) a person who has reached the age of majority in your province or territory of residence who is using the Platform to manage or track a health issue (i) on your own behalf; (ii) as a parent or legal guardian acting for a minor person; or (iii) for a person who is incapacitated and unable to use the Platform; (b) a caregiver for an eligible User; (c) a health care professional (e.g., doctor, nurse or case manager); or (d) a guest authorized by an SCC employee. By registering as a User, you represent that you are a person who has reached the age of majority in your province or territory of residence. To access and use the Platform, you will need your own computer or mobile device and high-speed Internet access. To register, you will need a user name, email address and password (collectively, the “Registration Information”) as well as your MAFCA service plan number. You are responsible for maintaining the confidentiality and security of your Registration Information and for any and all activity that occurs under your My MedicAlert account; you will promptly notify SCC of any unauthorized use or breach of your My MedicAlert account. Once you register as a User, SCC may send notices concerning the Platform to you by email at the then-current email address provided in your Registration Information. You hereby expressly consent to SCC’s delivery to you of such email notices. In accordance with the Canadian Anti-Spam Law (CASL) or similar laws in other jurisdictions, you can withdraw your consent at any time and all email communications will have an unsubscribe option. All the information and material provided via the Platform, including content, survey questions, images and SCC policies, are for informational purposes only and are not intended to serve as, do not constitute and are not a substitute for professional medical advice or treatment. SCC does not recommend or endorse any specific tests, physicians, products, procedures, opinions or other medical, health-related or other information that you may find on or through the Platform. Further, the Platform in no way replaces, supersedes or substitutes in any way for MAFCA’s 24/7 medical hotline that enables paramedics, other health professionals and other authorized individuals to access and use your detailed health records, whether in whole or in part. Always seek the advice of your physician or other qualified health provider with any questions you may have regarding your health and/or your particular situation. Never disregard professional medical advice or delay seeking advice because of something you have read on or learned via this Platform. Neither MAFCA nor SCC is liable for injury, death or any other damages incurred or suffered by you or any third party arising out of your use of the Platform. SCC has not sought or received any regulatory approval from any government agency for the Platform. You will not upload, post, email, or transmit or otherwise make available any unsolicited or unauthorized advertising, promotional materials, “junk mail,” “spam,” “chain letter,” “pyramid schemes,” “affiliate links” or any other form of solicitation. You will not upload, post, email, transmit or otherwise make available any Content that violates copyright, trademark or other laws protecting intellectual property or that violates an individual’s publicity or privacy rights. You will not upload, download, transmit or otherwise make available any code or material that harms or interferes with any device, software, network or service. You will not violate any laws or regulations in your province or country(Including laws governing intellectual property rights ,online conduct or online content)in connection with your use of the plaformand will complay with all aplicable laws and regulation your use thereof.You represent that:(i) your Registration Information,your Content and any other information that you provide via the platform is true,accurate and not misleading:and (ii)you have all riights,licences permissionsfrom third parties to use,reproduce,publish and display content belonging to others as part of your Content. SCC will review and consider any and all ideas, suggestions or other feedback concerning the Licensed Solution that you provide to SCC (“User Feedback”); provided that SCC may freely use any and all User Feedback and further provided that you will not retain any rights therein or thereto. If you are a copyright owner or an agent thereof and believe that any content on the Platform infringes on your copyright, you may submit a written notification to SCC with the following information: (i) your name, address, telephone number and email address; (ii) a description of the copyrighted work claimed to have been infringed or if multiple copyrighted works are covered by a notification, a representative list of such works; (iii) a written statement that you have a good faith belief that use of the material(s) in the manner complained of is not authorized by the copyright owner, its agent or the law; (iv) a description of the location data for the electronic location on the Platform of the allegedly infringing material(s); (iv) a description of the claimed infringement; (v) the date and time of the commission of the claimed infringement; and (vi) a written statement that the information in the notice is accurate, and that you are authorized to act on behalf of the owner of an exclusive right that is allegedly infringed, if applicable. The Platform may contain link to other websites that are not under the control of the Platform or SCC The inclusion of any link does not imply endosment by MFACA or SCC of such site or and neither MAFCA nor SCC is responsible for the content of such link sites. SCC may immediately suspend or terminate your access to the Platform without prior notice on reasonable cause as determined in SCC’s sole reasonable discretion. SCC may also terminate your access to the Platform without cause if SCC terminates access to all Users. On termination, SCC will deactivate and/or delete your account to the Platform (My MedicAlert) and your Content and any other data or information thereon and bar any further access to that account by you or any third party. SCC has no obligation to maintain, store or transfer to you any of your Content that you have posted on or uploaded to the Platform. If you object to information or materials on the Platform other than your Content, you should cease using the Platform and request cancellation of your account. For clarity, termination of your account to the Platform (My MedicAlert) will not affect your service plan with MAFCA. To the maximum extent permitted by applicable law, you use the Platform at your own risk. Neither MAFCA nor SCC nor any of their respective suppliers, resellers, partners and affiliates will be responsible for any harm to any computer equipment or device, any loss of data or any other harm that results from your use of the Platform. NEITHER MAFCA NOR SCC NOR ANY OF THEIR RESPECTIVE SUPPLIERS, RESELLERS, PARTNERS AND AFFILIATES GUARANTEE THAT YOUR USE OF THE PLATFORM WILL BE UNINTERRUPTED OR ERROR-FREE. TO THE MAXIMUM EXTENT PERMITTED BY APPLICABLE LAW, THE PLATFORM IS PROVIDED “AS IS” AND “AS AVAILABLE” FOR YOUR USE WITHOUT WARRANTIES OR CONDITIONS, EITHER EXPRESS, IMPLIED OR STATUTORY. NEITHER MAFCA NOR SCC NOR ANY OF THEIR RESPECTIVE SUPPLIERS, RESELLERS, PARTNERS AND AFFILIATES MAKE ANY WARRANTIES OF MERCHANTABILITY, FITNESS FOR A PARTICULAR PURPOSE, SATISFACTORY QUALITY, QUIET ENJOYMENT OR NONINFRINGEMENT. THE LAWS OF CERTAIN PROVINCES MAY NOT ALLOW THE DISCLAIMER OF IMPLIED WARRANTIES. IF THESE LAWS APPLY TO YOU, SOME OR ALL OF THE DISCLAIMERS MAY NOT APPLY TO YOU, AND YOU MIGHT HAVE ADDITIONAL RIGHTS THAT VARY FROM PROVINCE TO PROVINCE. The advice, recommendations, information and conclusions posted by other users of the Platform are not in any way vetted, approved or endorsed by MAFCA or SCC, and you use any and all such advice or other information at your own risk. Neither MAFCA nor SCC will be responsible for any failure of performance hereunder due to causes beyond its control, i.e., acts of God, acts of terrorism, denial of service attacks or unauthorized network intrusions or the stability or availability of the Internet. NEITHER SCC NOR ANY OF THEIR RESPECTIVE SUPPLIERS, RESELLERS, PARTNERS AND AFFILIATES WILL BE LIABLE TO YOU OR ANY OTHERS FOR ANY CONSEQUENTIAL, SPECIAL OR PUNITIVE DAMAGES, EVEN IF ADVISED OF THE POSSIBILITY OF SUCH DAMAGES. THE AGGREGATE LIABILITY OF EACH OF SCC AND THEIR RESPECTIVE SUPPLIERS, RESELLERS, PARTNERS AND AFFILIATES TO YOU FOR ANY CLAIM HEREUNDER WILL BE LIMITED TO CAD$1,000.00. THE LAWS OF CERTAIN PROVINCES MAY NOT ALLOW THE EXCLUSION OR LIMITATION OF LIABILITY FOR CONSEQUENTIAL DAMAGES. IF THESE LAWS APPLY TO YOU, SOME OR ALL OF THE EXCLUSIONS AND LIMITATIONS MAY NOT APPLY TO YOU, AND YOU MIGHT HAVE ADDITIONAL RIGHTS THAT VARY FROM PROVINCE TO PROVINCE. Your use of the Platform is always voluntary. After you register as a User on the Platform, you are always free to choose whether or not to participate in a survey, free to choose not to answer any specific non-required questions and free to discontinue your participation on the Platform at any time. Health Storylines™ and the Health Storylines logo are trademarks of SCC. You may not reproduce, display, modify and/or use these trademarks or tradenames in any manner without SCC’s prior written permission. You may also not reproduce, display, modify and/or use the MAFCA Marks in any manner without MAFCA’s prior written permission. SCC reserves the right to modify the Platform at any time and from time to time without prior notice to you.